Finally, from the 1st of January, 2011, every building put up for sale or lease will be accompanied by an Energy Performance Certificate. Law no. 372/2005 on Energy Certificate for Buildings should have come into force in 2007, but was postponed several times, most recently, even on 29 December 2009, when the deadline was moved to the 1st of January, 2011. This time, the Ministry of Development decided not to approve a further postponement. 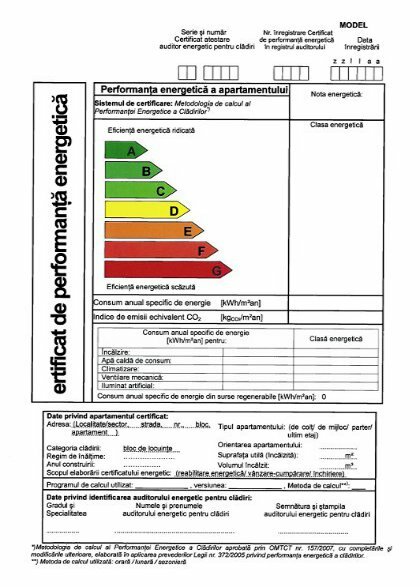 The Energy Performance Certificate or Certificate of Energy documents the results of an energy and thermal analysis, declaring and certifying, in a unitary form, the energy performance of a building, discussing in detail the main energy features of the construction and its related facilities. Depending on the reached energy performance, buildings are classified into 7 classes on the energy scale, ranging from Class A, which is characterized by the lowest energy consumption and up to class G, corresponding to the highest energy consumption. The scoring is from 1 to 100, calculated using well established criteria, where the building with a higher energy efficiency will reach a higher score. The Energy Performance Certificate gives the buyer information on the actual energy consumption of the building, on the monthly maintenance costs, and how much money will be spent to bring their home to “optimal conditions”. The certificate will, therefore, promote more accurate determination of real estate prices, meaning that prices of buildings with a high energy efficiency will increase, because they are less expensive to maintain, compared to buildings that are not that efficient. The Energy Performance Certificate for buildings is issued by the energy auditors for buildings, who are certified by the Ministry of Regional Development and Housing. According to the real estate agents the Energy Performance Certificate will be useful for future buyers and tenants, representing a document that defines the long term cost of the building. For now, considering the insufficient information, people are not very excited about the new law, and perceive the document as an element of cost that suits nobody, and which leads to complicated negotiations between the parties. They believe the role and the importance of the Energy Performance Certificate will be understood by the Romanian population only after a few years. As a result of Law no. 372/2005, a person can sell or rent a building only if the Energy Performance Certificate for the building is obtained, since in its absence the transactions between the parties cannot be authenticated by a notary. But the Council of Notaries Public has issued a decision that identifies several cases where it is still possible. In response to this, the Association of Energy Auditors for Buildings in Romania warned that without an energy certificate, contracts of sale or rent may become null. A new clarification is expected from the Ministry of Development, regarding this matter. More information about this debate can be found on greenreport and AAEC. Thereby, this certificate will lead to more accurate determination of real estate prices, meaning that prices of buildings with a high energy efficiency will increase, because they are easier to maintain, compared to buildings that are not that efficient. Depending on this the customer will be able to decide whether to purchase a Class A, highly efficient building, or a class E one with in a lower efficiency. Energy Performance Certificate for buildings is issued by the energy auditors for buildings, who are certified by the Ministry of Regional Development and Housing.